Volkswagen has released the first official details and images of the Golf GTE plug-in hybrid ahead of its unveiling at the Geneva Motor Show in March. 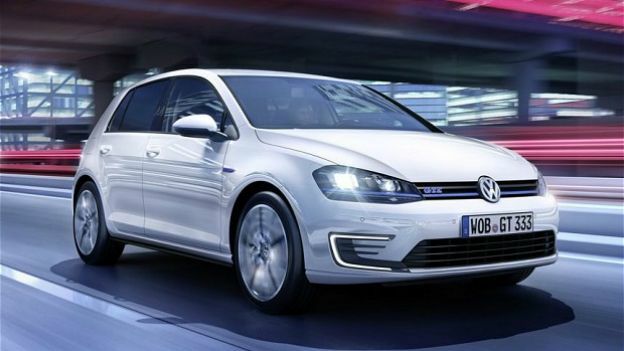 The Volkswagen Golf GTE hybrid uses a normal engine plus an electric one which can be charged from an external power source. That means short drives can be done entirely on the electric, while the engine motor kicks in to charge the battery and drive for longer. The Golf GTE comes with a 1.4 litre TSI engine and an electric motor capable of a combined power output at 200 horsepower with 350Nm of torque. The electric motor can manage 31 miles on a charge of the 8.8kWh lithium-ion battery. Whilst the electric motor is limited to 81mph, it can reach up to 135mph when combined with the petrol engine. Acceleration from 0 to 62mph takes 7.6 seconds and offers a massive 188mpg fuel efficiency with only 35 g/km of CO2 emissions. The Golf GTE uses regenerative braking to charge the battery which can also be topped up to full in just three and a half hours from a normal domestic mains outlet. Other features include LED lights, an 8-inch Discover Pro sat nav, DAB radio and Bluetooth connectivity. It comes in five-door only and will set you back about £28,000 tipped with a release date before the end of 2014. The Volkswagen Golf GTE will be given its world premiere at the Geneva Motor Show starting March 6 and is expected in showrooms late November. Thinking of going green? Check out our selection of the Best electric cars 2014.